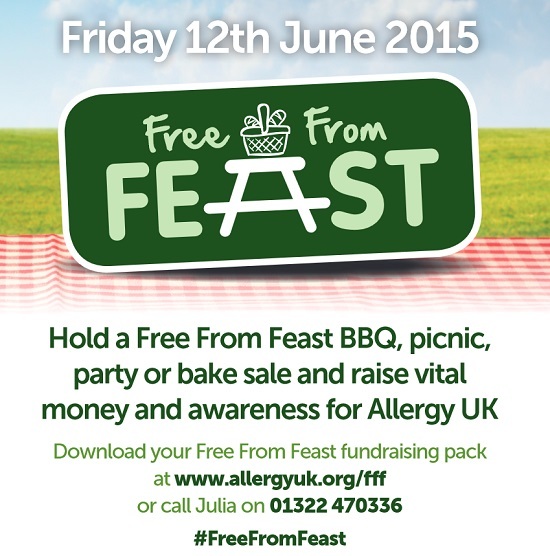 Allergy UK are holding our annual Free From Feast event on Friday 12th June 2015 to help raise awareness of the charity and funds to support the work they do. You can get involved by holding a picnic, cake sale, BBQ, dinner party or street party free from allergens such as egg, milk or wheat/gluten. If you’d like to be involved, please register here today! A printed Free From Feast Fundraising pack including lots of ideas to help you plan your feast, sponsorship forms to collect donations and event posters to start promoting your event. To let AllergyUK know about your fundraising plans or for more information about the Free From Feast initiative visit www.allergyuk.org/fff or call Julia on 01322 470336. Every Free From Feast will help Allergy UK continue their support to people living with allergy. The Basket Company are the official supporters of Allergy UK’s Free From Feast 2015. So anyone planning a Free From Feast? Please share your details here. I would love to organise one myself but may be on holiday at the time. No excuses I know but a blogger needs a holiday from all things blogging and allergies. No doubt Mr What Allergy and myself will be having our usual picnic lunch anyway so we’ll share some pics if we do. Good luck my free from feasters. I’m thinking Artisan Bread, Miracle cake, some Frank Bars, Nairns oat cakes of course, some humous, Green’s gluten free ale, an apple and maybe even some home made flapjacks. Bring it on.